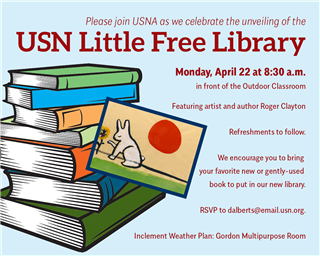 Join us for USN’s Little Free Library dedication at 8:30 a.m. Monday, April 22 in the Outdoor Classroom, and drop off children’s and young adult books throughout the week. Greetings, USN book lovers. Spring may be in the air, but our team is already thinking about the fall. The Fall Book Frenzy team is ready to take some books off your hands, and we have some exciting news to share. We will be doing a limited spring collection of children’s and young adult books in April. This category is always a big seller, and we hope to greatly expand our offerings this year. 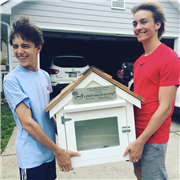 We are thrilled to announce that USN parent Carrington Fox has designed, constructed & generously donated a community book box; it will be registered as an official Little Free Library site. The Little Free Library will be planted near the Outdoor Classroom on 19th Avenue. We believe it will be the perfect expression of our love of books and reading, and to share those with our neighbors. So, please comb through your shelves and let us take those gently used children’s and young adult books off your hands. 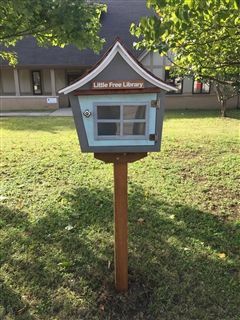 We will kick off the week by dedicating USN’s Little Free Library at 8:30 a.m. Monday, April 22 and gratefully receive donations throughout that week through Friday, April 26 during morning hookup at both the 21st and 19th Avenue sides of the school. Large bins for donations will also be located inside the Lower School and 19th Avenue lobby during the week of collection. As always, we are looking for helpers with book collection and sorting. Click here to volunteer. The Fall Book Frenzy is a three-day fundraising event celebrating books and reading. Its success each year depends entirely on your donations of overflowing bags of books and other treasures. Donating to the Fall Book Frenzy is a great way to support USN and to share in the USN community’s excitement over books and learning. Proceeds benefit the Hassenfeld Library and have been used to expand the collection, build additional study rooms, bring authors to campus, and add a hydration station. The Fall Book Frenzy donates remaining books to local nonprofit organizations and public school librarians, teachers, and media specialists. For more information or to volunteer, contact co-chairs Jennifer Aaron or Nicole Brod. Last fall, Fall Book Frenzy and parent volunteers planted this Little Free Library at St. Luke's Community House in North Nashville.